John Richards Junior (1854 - 1886) was a highly skilled slate carver who lived most of his life in Willunga. 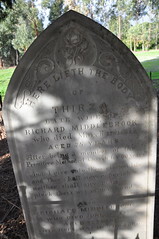 In 1854, he travelled to South Australia on the ship Emigrant as an infant with his parents, John Richards and Mary Richards (née Mullis), and his older brother, William. His family had lived in Camelford, Cornwall, England, which is an area that is well known for its slate. When the family settled in Willunga, John Junior and his family lived at 15 Aldinga Rd. It is likely that John Junior went to school, although that school is unknown. 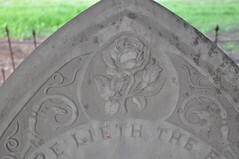 His carvings, however, have often been influenced by classical themes, and even the cemetery headstones he carved are generally distinguished by romantic designs. John Junior made his living as a bootmaker, and his shop was located at 22 High Street, Willunga. At night, he would work on his carvings, which he exhibited in various shows and exhibitions. His works included Ino and Bacchus, St George and the Dragon, Triumph of Love and the head of Rev. E.K. Miller. John Junior seems to have first started exhibiting his work in 1871 at the age of 17. In 1877, he entered a bust of the governor, William Jervois, in the Chamber of Manufactures Exhibition. Governor Jervois noted in a speech at the Exhibition that a great deal of credit was due to him [Richards] … as he could not have seen him more than once or twice in his life, or what was more likely had only used a photograph (SA Advertiser, November 19, 1877, p.6). John Junior never married, but he was active in sport as a committee member for the Willunga Cricket Club, and a private in the Willunga Rifle Volunteers Force. His last exhibit appears to have been a carving of Australian scenery, exhibited at the 1886 Willunga Show approximately one month before his death. The untimely death of Private John Richards, of Willunga Company R.V.F., whose funeral took place here today, has cast a deep gloom over our neighbourhood, as the deceased was widely known and much respected. The cortége was very long, and fully 500 people attended the funeral, which was the first military funeral in Willunga. John Richards Junior’s work ''Ino and Bacchus can be viewed in the Willunga Slate Museum. You may also see gravestones in the St Stephens and Uniting Church cemeteries in Willunga, and Strouts Road Cemetery near McLaren Vale. Do you know the whereabouts of Willunga slate carvings from the nineteenth century? The Slate Carving Identification Project has been established to identify and record Willunga slate carvings from the nineteenth century. Please contact Paddy O’Toole (paddy.otoole@outlook.com) or Mark Staniforth (mark.staniforth@flinders.edu.au) of the Willunga National Trust if you have slate carvings (e.g. mantlepieces, busts, reliefs). All we seek to do is to identify and photograph the carvings for further study. Slate headstone carved by John Richards, junior. Do you remember Richards, John Junior ? Then Join up and add your memory here.